I admit to having been a total kill-joy last Monday, writing about Lent on St. Patrick’s Day. This week’s post will make up for that. Even though St. Paddy’s Day isn’t a significant event in my life (likely because usually I’m in the throes of Lent at the time), the mystique of Ireland was a powerful inspiration for me in the early days of my novel-in-progress. Not because the story itself has anything to do with Ireland (it’s set in medieval England), but instead due to some of the books I was reading and music I was listening to at the time: two fabulous works whose recommendation is a far more pleasant St. Patrick’s Day greeting (however overdue) than my blathering on about giving up indulgences and society falling apart. The Sevenwaters Trilogy, written by Australian author Juliet Marillier, is a lyrical, mythic, dynastic family saga of the clan from Sevenwaters in their struggle to preserve the Old Ways and fulfill an ancient prophecy of the Tuatha Dé Danann (the Fair Folk). The series begins with Daughter of the Forest, which is a fairytale-like retelling of the Celtic “Swans” myth – the story in which a young woman’s six older brothers are magically transformed into swans. In order to change them back, she must weave six shirts out of nettle – which is physically painful to work with – while not once uttering a word during the long years it takes her to complete this task. 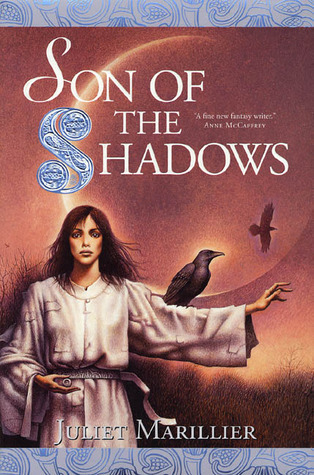 Son of the Shadows, the second book of the series is one of three books that has most directly influenced my WIP. It is narrated in a less fairytale-like tone, but tells an equally compelling story about a mysterious mercenary known as the Painted Man, and a woman whose birth – and especially whose powers – were not foreseen in any of her mother’s visions. Most of the inspiration I obtained from this book pertained to its villain. Not so villainous per se, but rather had suffered having great responsibilities thrust upon at a young age, and grew up lacking the emotional strength to cope with the various reversals he’s suffered, he was a strong influence for my WIP’s antagonist. The trilogy concludes with Child of the Prophecy, which chronicles the desperate actions of a woman born of a forbidden love, and sees the ancient Tuatha Dé Danann prophecy brought to its bittersweet and somewhat startling fruition. Anybody who enjoys new age music has likely heard of Enya, and perhaps even Clannad, the late 80s/early 90s Celtic group formed by the Brennan and Duggan families (Enya’s siblings and uncles) wherein Enya got her first start as a professional musician. But have you heard of Moya Brennan? 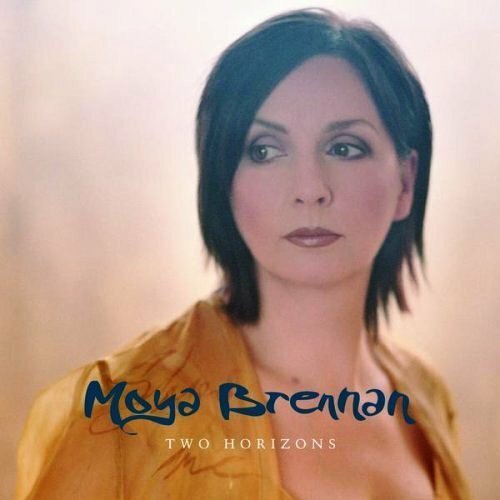 Moya – Enya’s older sister – was the lead singer of Clannad, and is a talented solo artist in her own right. Like Enya (Eithne), Moya has adopted an English phonetic spelling of her name (Máire), both for ease of pronunciation among non-Irish speakers, and to distinguish between her earlier solo releases, which were a bit more Inspirational/Christian than her later material. Two Horizons, Moya’s first new age album, was my favourite CD of 2003, and remains one of my favourite albums to listen to while writing. It’s a concept disc and suite of recurrent musical themes that tells the evocative story of the search for the lost harp of Tara – an inner quest of the imagination that transports the listener through the ages as the harp repeatedly changes hands and travels to new and exotic lands inhabited by people living mythic lives. The album blends modern instruments and traditional Irish ones like the Uilleann pipes, the bodhran, the fiddle, the Irish whistle, and of course, the harp. I can see the other side…. Calling out just to hear your name. I can’t recommend either The Sevenwaters Trilogy or Two Horizons enough for anyone who’s either a fan of Irish mythology or is looking for to bring a touch of fantasy, beauty, and enchantment to their entertainment. Happy (belated) St. Patrick’s Day! What books or music (set in any country, of any genre) have inspired your WIP, or something you’ve previously written? Let me know in the comments. This entry was posted in Music, Writing and tagged Books, Characters, Fantasy, Inspiration, Lent, New Age, Novel, Novel writing, St. Patrick's Day, Writing inspiration. Bookmark the permalink. The whole album is magical – I really can’t recommend it enough. You should search it out on YouTube to hear the rest. There is indeed an otherworldliness to Irish music and mythology that I just adore, although you’re right – there’s plenty of suffering in there. I suppose that’s true of the music and stories of all ethnicities, for as a species, humans seem to love inflicting hardship on each other. Although some might argue that the best stories, music, and art are born of hardship and suffering. Hey, that Patrick McCabe excerpt I posted last time is from a book set in Ireland. As someone who is 1/8th Irish, I feel fully qualified to discuss all things Irish. For example…. Um. Well, read your post. It was pretty good. Actually, I do love looking at illuminated manuscripts from medieval Ireland. The painstaking effort and skill that went into making a single page is remarkable. Question: How do you feel about potatoes? Funny story that about the potatoes: I took a 200-level biology class as part of my undergraduate degree in which the whole course was learning about the other three Kingdoms (i.e. everything that’s not a plant or animal, so fungi, protists, and bacteria). One of the things we learned was the broad category of bacteria responsible for the Irish Potato Famine. My roommate and I were in the same degree program and class, and both got that question wrong on the final exam. Yet we both had the same incorrect answer, and swore it wasn’t wrong at all. To this day, I still don’t know what the right answer is. Er, I mean, go raibh maith agat! So many roads lead back to Ireland – I don’t think I knew you had an affinity to the country Janna? My present novel in draft is set in West Cork and has more than a sprinkling of Irish fantasy. I relied mainly on Yeats for research – he was in thrall to the ancient legends. The people of Ireland have suffered so badly down the years it’s no wonder that you can almost see and touch their spirits under the right conditions. I have an affinity for anything very old and steeped in wonder, and Irish legend and mythology is definitely that. …you can almost see and touch their spirits… So elegantly put!